The best part of the Wind Symphony tour is the ability to bond with my fiends and my band director, Mr. Lack. Before the tour I was rather unsure of him and over the course of the season, marching and concert, I have learned a great deal from him. Mr. Lack has taught me to the art of patience, the way how modesty goes a long way and how the listening is the true form of communication. Over the trip, even only being half way done, he has opened up a significant amount so not that I can see who he is not only as a band director, being Mr. Lack, but as a person, being John Lack. I would just like to thank you for everything that you’ve done for this program this last year and I cannot wait to see on how spectacular it is to become. On the first day of our tour to the Pacific Northwest I had the pleasure of having the experience of a lifetime; the opportunity to punch a solid ice wall. To be completely honest I thought it was a wall of snow, though my hand soon found out it was not the hard way. Though the pain was cosmic my mind was still blow away from the view that we had been gifted. The wide range of hills covered in trees and snow with rivers running through them, some made of ice. I don’t think that I’ll ever forget the beautiful view we saw that day,the pain in punching an ice wall and the laughs we had talking about it. During this trip, I got to experience my first natural waterfall. I had always seen videos and photos of them online and in documentaries, but I never truly understood how magical they could be. The slippery ground, the mist against your face, and even the resulting rainbow are something I will never forget. Getting closer and closer to the fall was spectacular in every single way. I never felt more close to nature in my entire life and it made me feel something indescribable. This trip has been so incredibly life-changing and I just want to thank everybody, especially Mr. Lack and all the chaperones for making this one of the best weeks of my life. I wouldn’t take back this week for any amount of money or anything at all. Thank you so much. One of my favorite memories from this trip, aside from all of them, was when we trekked through the muddy forest. I know it’s unusual to say that getting filthy in the name of a not-that-great view was a favorite of mine, but I had such fun that day. Walking on a treacherous path with some of my best friends was an adventure that I won’t soon forget. The fun of it was in the fact that it felt so silly: to be going for a hike in a beautifully precarious place was awesome! The forest around us, I’m sure looked exquisite, but we couldn’t take our eyes off the trail for fear of slipping and falling to our death! I had an amazing time this trip, but that especially was exhilarating. We all live our own lives. Some filled with happiness, some with sorrow, some eventful, some routinely. As I live day to day I see only through my eyes, never realizing my life is dictated on those around me and the environment as well. Throughout this tour I was given a life changing chance. To live another’s. To live another’s life. Filled with their sights, their sounds, their happiness, and their pride and joys. I can’t pin point a single time in which I loved the most. From seeing high school students eat at the cottage bakery in the morning, to seeing faces walking around the market of Seattle that look just like the faces of those at home. When I stepped in another’s shoes I thought they were so lucky to live in this environment, around these people, but it soon opened my eyes more than anything. It showed me how grateful I am to live in a community that holds so much pride in being a part of, and seeing how people gather around to go to the rodeo, and parades, and all things we hold dear to our heart. So if I had to choose what specific point I enjoyed the most. I’d say the point in which I opened my eyes. My favorite experience from the tour was the hike in Cape Disappointment State Park. I typically am one to opt for leisurely beach walks, not muddy terrains however, this experience changed my mind. Struggling to walk on a slippery and steep path with my friends has been the most fun I’ve had in a long time (after getting over the fact my shoes were covered in mud). The view of the ocean waves crashing between the two mountains was breathtaking. My favorite part was the community of my peers lending a hand to each other. As we were all slipping over the tree roots and uneven steps, there were words of encouragement and support. It felt good to laugh about falling or slipping with people I don’t talk to often. Obviously, the views and memories were totally worth ruining my new Vans. Everyone’s definition of a friendship lies on a very broad spectrum of relationship strengths. To one, a friend may be someone who you’ve known your entire life, to an acquaintance that you only talk to in your math class. However, the spring tour has redefined this word in numerous ways. The most transformative moment was when Thomas, Josh, Brendan, Ryan and I discovered this elegant but welcoming coffee shop in Long Beach, WA. The moment we walked in, I felt our atmosphere change from excited and fluttery, to calm and collected. After we all bought our drinks, we scanned all the antique paintings, sculptures, and books that were displayed about. At that moment, I realized that we all had a common love for antiques. When we sat down at one of the dainty tables, we just sat and talked for a long time. Although this experience was not something wild or ground-shaking, having a wholesome conversation and learning more about the people that I love truly makes me the happiest I can be. In conclusion, I have learned that a friend is someone who makes you feel like you belong; someone who you feel that you can share something special with and them being there somehow makes it something even more meaningful. Without this trip, I would have never discovered this little coffee house, in a little town, with my closest friends. And that experience was definitely a once in a lifetime moment. When the word “happiness” is said, there are quite a few things that come to mind. Everyone has their own distinct place that their mind takes them when they are happy. However, I have never had a time, place, or feeling set to mine. This week, I found the one place where I truly felt happy and at ease. All of my worries seemed to melt away at Multnomah Falls in Oregon. The sight of the water rushing down the tree laden mountain, the whooshing sound of the water hitting the rocks, and the feeling of a chilly mist against my skin made me feel like nothing else mattered in that moment. And the fact that I got to experience that with people that I care about made it that much happier. There aren’t enough words to describe what I felt throughout this trip. No abundance of extravagant words can come remotely close to conveying the joy that this program brings me. I truly adore each and everyone one of my peers so much and being able to travel and create memories with them is something I’ll treasure forever. My time in high school is soon coming to an end; in June, my classmates will go their own separate paths. I know that once I graduate, I’ll lose contact with these cherished friends. The promises of checking in every now and then, broken. And as sad as that may be, I look forward to a day in my future when I reminisce on these beautiful memories. I’ll have forgotten people, streets, and views - memories unraveled like motion blur of a camera - but I know I will never forget this bright, warm feeling of sheer happiness that this trip has gifted me. This photo doesn't really represent anything but I liked that it had my name. The one thing that I am going to take from this trip is just everything I had the chance to see. Sure it was fun to play at these different places and to see and talk to people from a very different culture, but I don't think I have ever seen so many things in one trip that I have never seen in person before. The Ferry and riding it was huge for me, it was just amazing to watch as the world shifted around me in a way I was so unfamiliar with. Sitting off of a small cliff at the fake Stonehenge, the sight was just so beautiful it was hard to notice the 40 ft drop below. The Columbia river was absolutely amazing, and the huge bridges we crossed were just outstanding. The Space Needle was absolutely amazing, certainly made me sit and stare for a long time as I looked out towards the vast land of Seattle and down towards the many ant like humans on the ground. I was so breath taken by the sights this trip, there was nothing better then the sights. Hiking has never been my strong suit; long distance flat land has never been a problem before, but hills and steep places have been. Years ago, asthma was added to the list my doctor kept for me, and it’s been making a lot of trouble for me for a good while. In this case, steep, muddy hills got the asthma to kick me in the legs and to my surprise, not being able to breathe isn’t so fun. In turn, I went back down to the bus to clean up and to breathe again. This may have been my least favorite part of the trip, but it was still an experience in itself and I’m so happy I was able to push my limits by going down and by coming back up the muddy hill. The day of tour we went to the Museum of Pop Culture was something that I’d been excited about the entire trip. As soon as we got there, Asia, James and I broke off and started exploring, going into the horror exhibit pretty early on. If I’m to continue this story at all, you have to know that James hates horror. He despises it more that you could ever understand and only went in because Asia and I were interested in the exhibit (which ended up being pretty awesome). There were a bunch of props from movies and shows like Buffy the Vampire Slayer and Nightmare on Elm Street. The scariest part for James was the Scream Booth. Asia and I went in first expecting for there to be some sort of jump-scare, but there was nothing, so we finally convinced him to hop in and he seemed to relax a little (at least until we stepped back out). Luckily for all of us, the sci-fi exhibit was right next door so Asia and I got to see more interesting objects and props while James tried to lower his heart rate. So for me I think the most exciting thing about this trip was getting closer with my friends. It’s funny to think that we can learn so much more about the people we’re closest to just by having a conversation. It was fun getting to see the Pacific Northwest with such an amazing group of people. Also a bonus was getting to know Mr. Lack a lot more and getting to connect with him on another level was one of the highlights of this trip for me so if you’re reading this thank you for that. Anyways this is getting really long and if you want to know more about our adventures just ask :)! If I were to choose my favorite moment from the trip I would say it was the walk from the ferry into Seattle. Not many people would view this as a big deal, but for me, it was a very powerful moment. I haven’t been back to Seattle since my birth, so the first step onto the crowded streets felt like returning home after a long journey abroad. Disregarding the mass amount of sketchy homeless people, the city was really nice and I enjoyed exploring the streets with my friends. Go Seahawks!! One of the most breathtaking views on this trip was the overlook from the Seattle Space Needle. From the Needle, we could see the whole city of Seattle before our eyes. The livelihood of people and the business of daily life in this somewhat remote city brought about a sense of tranquility within me. This was also brought upon by the beautiful mountain ranges and sky that seemed to go on forever. The mountains appeared to pierce the sky with its almost mythical height and the clouds spread across the sky like a blanket, holding the whole city in its embrace. The waterfront also looked upon with awe by myself. The daily commute of boats across the water brought life to the wilderness that surrounded the city. The overlook of the Needle can’t be described by sheer words alone, only by the emotions it draws out from humans who are privileged enough to gaze through its sight. The spring tour was a bonding experience between every single student, and our director. There were so many great moments, and although I missed half the trip due to my illness, what I did get to experience was the coming together of a group of people who are so different. To see such an eclectic group of people all bonding and coming together as one was heartwarming. My favorite part of the trip was seeing the water fall, I love waterfalls, and enjoying it with my friends made it even better. And to please Asia I will have to include my card only having $3 on it when the bill was $24, she thought that was pretty funny. What a comedian. Everyone is writing such emotional paragraphs but I have to add this, Asia woke up at 6 AM, rolled over and said nothing but “Chip” and popped open her can of Pringle’s in complete darkness, it was the funniest thing I’ve ever seen. The waterfall was beautiful. The mist caressed my face, the water crashed against the rocks, and the wind flowed all around. The serenity and calmness of the waterfall was gorgeous and majestic and enticed me to enjoy pure nature. The plant life greener than the color green and the water whiter than the color white. Along with many other firsts, the waterfall forged an unforgettable memory of tranquility and beauty, which will glow for decades to come. We all know I think this trip was amazing, as everyone has, but let's be real: it didn't go without a hiccup. At least for me it didn't. And that's okay; it was perfectly imperfect, like all of us. One of my absolute favorite days on this trip was Saturday, and although it started out a little rocky from the night before, it ended on a very high note. It was perfectly imperfect. We got to play at the Music for All festival in the morning for a great audience and the energetic performance went smoothly for the most part. We will never be perfect, but it doesn't matter as long as we are working towards being the best band we can possibly be. Later that evening, we arrived in a quiet area known as Cape Disappointment Park and Mr. Lack told us we were going on a hike to a lighthouse; sounds like a great idea, right? Beautiful day, sunny, gorgeous scenery. Well then we started to walk, and we realized that we stuck in the mud. Literally. It had rained all morning and it was insanely muddy. The sounds of the birds and trees flowing in the gentle breeze helped drown out “MY WHITE SHOES!” I was also wearing white shoes, but figured I could just wash them as soon as I got home. Ha! We trekked down a very steep and dangerous hill (don't worry parents, we were fine) to a small cove that was absolutely stunning, the sort of stuff Instagram models take pictures in front of. Very cute. Very trendy. One after another we all started to slip and fall in the mud, and I couldn't help but think of the Queen song, “Another One Bites the Dust.” We spent a good chunk of time there and it was really fun. The sand helped clean out shoes, bonus! Then we ascended back up… at least we had a moment of levity with clean shoes. Oh well! Once back up, after another ten people or so fell, we made it to the lighthouse and back down where at the last stretch, I fell for the first time at the front of the line because I was laughing at my friend, Izzy, for falling and rolling around in the mud. We zoomed on over to a cute pizza place in this quiet beach town that was eerily similar to Aptos, California. We laughed, had a good time, and went down the street to go karts. Everyone was acting like it was this big competition, but really the cars all went the same speed so you stayed generally in the same spot as you started. Y'all got pranked. Everyone was screaming about passing the person in front of them while I was screaming because I was scared of getting my hair caught in the moving gears of the go kart. After a few rounds (thank you for the first round, Mr. Lack) and a small trip down a few blocks we arrived at a cute Lodge on the beach; this is where things got really fun! There was a night beach walk for us crazy people, and we laughed so hard, it might've taken some years off of my life! We were lead by our fearless leader, Mr. Lack, to the treacherous waves of Long Beach, Washington. We would try and get as close as possible and then run away before the tide could “yeet” us out into the ocean. We stayed out there for a solid few minutes, and at this point I had decided to throw out my now brown and soaking wet Converse with the giant hole in them. My parents have been bugging me to get a new pair anyways because the hole looked “trashy.” We walked on as some boys scared people following behind them and Mr. Lack was proud (BIG accomplishment). The satisfying night ended with a TERRIBLE game of beach volleyball; you would never know I was on varsity volleyball. My roomies and I went back to our room where we changed, relaxed, and began to do the whole girl sleepover sort of thing: talking all night, laughing our heads off, joking about pulling a prank on the person who falls asleep first (me). That night made the sort of rough morning definitely worth it. I hope everyone on this trip had a great time and is very happy about the outcome. You guys are raw. I expected this trip to be heavily focused on music and playing music, but boy was I wrong. This trip is probably the best trip I've ever been on. Hanging out with friends and sightseeing is an experience that cannot be compared to anything. I loved everything on this trip but the thing I loved most was how Mr. Lack prioritized our fun before everything else. I would like to thank him for these amazing experienced and for being our band director. I was in went to eat at Pikes Brewing Company the other day. With a menu so full of wonderful foods, sickly Sarah and I did not know what to choose; but we ended up choosing Mac and Cheese with bacon bits on top. As hungry as we were, it did not take us too long to scarf down 90% of our food with in a five minute period. Sooner or later, the check finally comes and Sarah and I frantically try to get the exact amount for the check, but as most of our table saw, Sarah and I are not the best with money. After a few long minutes of bickering we finally decide to pay with Sarah’s card. But here’s where Sarah and I become absolute fools. The waiter comes back and says, “ There was only 3 dollars left on your card so you still owe about 21 dollars”. Sarah and I, both frustrated, began to laugh uncontrollably as well as the whole group who offered to pay for the rest of our meal. However, Sarah and I are both stubborn so we ended up paying for the rest of our meal with our own money. The best part is that Sarah’s gift card was supposed to have around 200 dollars and so far she had only spent around 20. This day will go down in history as the day that both Sarah and I were completely broke beyond belief. We pulled in the lower deck of the ferry and we exited the bus to go get a view of us leaving the dock. As we passed around the mountain, we started to see little structures that looked a city. The closer we got, the more beautiful the city looked. With all its bright lights and skyscrapers that touch the sky, to the coffee shops and busy streets. I passed shop after shop and each to their own culture and identity. This trip is one i won’t forget. This spring tour has actually been such an amazing experience for me. We did so many things like going to see waterfalls (and falling, can’t forget that), going on a beach walk and go kart racing. But honestly my favorite parts were the things in between. The bus rides and the hotels were really important moments to me. In the hotel rooms it was always just endless laughter and deep conversations. The bus rides (even though they were super long) gave me the opportunity to get close with my friends. The scenery that passed by was beautiful and I’m so happy that I got to endure this opportunity. I hung out with new people and gained new friendships and made the ones I already had stronger. I’m never going to forget this trip, it was life changing. Honestly I’m not one for sighseeing, but this trip has changed it for me. With every rest stop, a view that takes the breath away. As you stand in awe taking in the atmosphere, whether it’s long and far flat plains, tall majestic mountain biomes, Stonehenge, or the Columbia River, Seattle, or the vast ocean, it’s all a sight worth seeing. Passing through the snowy climate was so much fun. I hadn’t played in the snow since I was back in Delaware about 7 years ago. The snowball fight with Mr. Lack was the first turning point of the trip for the Truly Wilde people. It was the point of realization that the days that would follow, would be filled with cheer, happiness, and fun. Being by myself on a trip without my family has taught me many lessons. One, that friends can be like family and bonding with one another is important in all situations. And two, that it’s essential to appreciate every moment you have in life. With this trip, there were copious amounts of moments where I relished the scenery and nature. One that particularly stood out to me was my time at Stonehenge. The view there was incredible, with the landscape and river strewn out beneath me like a painting on a wall. My favorite part about it was climbing the pillars placed around the area. I had fears when climbing up, but when I finally got on, the satisfaction was great. I did something that honestly I didn’t think I was capable of doing, and it truly was an amazing experience. After the euphoric rush of being at the top, I didn’t have such a soft landing. I clumsily fell to the ground, but it was worth it. Moments like these are what define life itself, and what make this Seattle trip so memorable. On our first day of tour we went through the mountains. They were all covered in beautiful white snow. Some of the trees were also covered in snow and they were like tiny dots against the big mountains. Everyone was breath-taken with the beauty of it all. The snow made everyone feel happy and we had fun playing in it for a while. Afterwards, we got back on the bus and there was a strong feeling between all of us; happiness. I came into this trip thinking I would have a great time and that it would be fun and exciting. I have had trips in the past that were similar and were amazing and that is what I expected for this one. Boy was I wrong. This trip simply blew me away. Getting to hear multiple great bands and hear ourselves play at our best was fantastic. The breathtaking sights were far from what I was used to in clovis and did not disappoint. And the best thing that really set it apart from the rest was that I got to experience it all with my friends. This was definitely a week to remember. One of the parts of the trip I enjoyed the most was visiting the Museum of Pop Culture. I was enthused by the fact that one of my favorite authors, Frank Herbert was indicted in the museum. Jen and I also visited the mixing room where we learned how sound engineers do their jobs and we were able to compare our own creation to the original song. We also got to walk up many stairs since the floor which we thought was open was not since it was under construction. One of the highlights of our visit to the museum was when we entered the scream booth in which we got to act out the part in the movie where we get scared. I, however was not scared by what was on the screen, but of the volume of Jen's truly ear-piercing scream which I did not believe was possible. It was okay since we are good buds and were having a great time. That was Jen and I's trip to the Museum of Pop Culture. Throughout the course of a week, I have experienced things that I never thought I would do. I got to see snow for the first time, hike with all of my friends, and see lots of beautiful places both on the bus and off. One of my favorite things on this tour was when we went to the Space Needle. Even though I am afraid of heights, I had a great time overlooking Seattle. The view from the Space Needle was breathtaking. I wish I got another chance to do this again because this by far was my favorite trip that I have ever been on. My senior year has been amazing and it’s thanks to Mr. Lack. Thank you for helping me not only become a better musician, but a better person. I have learned a lot from you and I appreciate everything you have done. Honestly, there's a lot I can say about this trip. The fact that it's the most I've ever traveled in a week is already a record-braker for myself, amongst other things. But anyways, my title is that for a reason. Over the course of this trip, I've learned that this may end up being the kind of life I'd live. One where I constantly travel to places to play and gain experience in music. But that's what the trip's about in it's own way, where it's possible that you could have these kind of trips. The add-on is that I have my friends with me, learning about this as well, and not just making myself a better musician, but they would become better as well. I will say that the reason I chose that picture is because... well... I actually don't have a real reason. None of the pictures I have really fit what I'm writing about. But I hope you enjoyed. 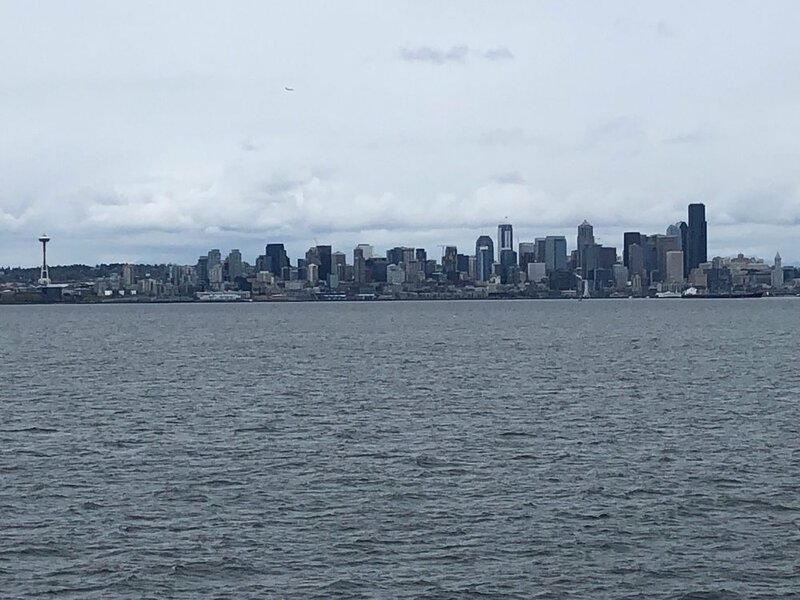 The air around me is fierce and blistering, I am surrounded by a mass of cold ocean air as I am travelling towards the Elliot Bay and ultimately Seattle. I stand, perhaps defiantly, holding my phone up against the wind near the edge of ship as I wait for the Bremerton Ferry to round the bend and finally reveal the Emerald City. As I wait, I look around to the many coastlines that surround me, hilly forested shores and little rivers of houses edging the border of beach and tree. I wonder how much land humans have conquered in this Pacific territory, whether or not humans should take all the space instead of leaving so many trees around where there should be a metropolis. My thoughts on nature preserves were quickly interrupted by the commotion of students on the other side of the boat, amazed at a seagull floating, not flying, above us. The ferry and the seagull were at matching speeds, and the bird seemed to hang in the air, threatening to drop something sinister on anyone on the deck. So instead I filmed the amazing bird. However by the time the gull flew off, Seattle was already in sight. My dissapointment in not being able to catch the first sight of Seattle was soon replaced by the grandeur of the skyacrapers on the horizon. Although my face was frozen, and the city was only a huddle of standing rectangles, I was happy; I knew I was going somewhere I would never forget. During this spring tour, I had some amazing experiences. I was able to say that I visited five states within two days. However the most memorable experience was probably that hike around Fort Canby. If anybody knows me well, they know I absolutely love hiking. So this getaway was very enjoyable for me. Around the start of it, it was a simple downhill slope, but then mud started to come. Then people started complaining about the mud in their perfectly white Vans. They were all complaining while I was in the front of the pack wearing my waterproof hiking boots. Our final destination was a lighthouse at the top of a large hill, overlooking the ocean. It was absolutely breathtaking. During the beginning, I was in the front wanting to see what was next. At the end, I was in the very back not wanting to leave this gorgeous view I had just discovered. This hike reminded me how important it is just to go hike and see the beauty of God’s green earth. Since this trip was about 60% bus rides, I feel like having fun with my friends on the bus had the biggest impact on my trip. I got to know the people around me a lot more just by playing road trip games and having conversations. Sitting around a mix of old friends and people I don’t talk to much really let me express myself to others while still feeling comfortable. I may not have slept very well on the bus, but the time spent with these people was worth it. I enjoyed noticing the different nuances in people’s personalities and learning about their lives. So as impactful this whole trip was, the bus rides will be what i remember the most. The very first day of the trip set a very high bar for the days to come. After a few hours of driving through lush mountain forests, a direct contrast to the urban setting of Clovis, the scenery began to include small deposits of snow. As the minutes passed and our altitude increased, the deposits developed into blankets that covered the land as far as we could see. We made our stop in an area where the snow was so deep that it completely covered the restrooms. My friends were debating whether or not to climb to the top of the drift because while it would be fun, one could get soaked, fall off, or just sink into the 11-foot-deep mountain. Mr. Lack approached, and contrary to our expectations, he actually encouraged us to climb up. Him and about a dozen of us made the climb successfully, and a snowball fight ensued shortly thereafter. We got to see the fun side of Mr. Lack, and also peg him a few times as well. While the snow on our bodies soon melted and drenched our clothes, our love for each other and the program solidified even more. The 2019 Buchanan Spring Tour was everything I thought It was going to be and more. With exciting concerts, amazing sights to see, and experiences I can look back to in 20 or so years. However, I believe the most significant part of the trip draws from it being the last one I will ever be apart of in high school and with my mother (and what a way to go out right). As the saying goes,” all good things must come to an end”. Each time I rode in the back of the bus with the boys or stayed overnight at a hotel; I knew that although it will be over soon, it gave me some of the best memories of just being a kid and having a blast. One man in particular who I will remember for years to come is one Mr. Lack The Legend. If someone were to tell me that at the beginning of the year I would one day be able to connect and have 1 hour long conversations with Mr. Lack I would have thought you were insane. Me, josh, and thomas got to connect with Mr. Lack one last time before we left and for that I will always be grateful. Before I leave the 2019 spring tour I want to extend my love and gratitude to my mother Rose. For those of you who don’t know my mother, my dad, and my little brother will be moving to Japan in june. Many people on this trip share this love for my mother as she’s has an amazing care for people and is willing to go the extra mile for someone( it doesn’t even have to be here own kid). She treats everyone as her own and that is what I love about her. My mom has been there for every trip and every activity that i’ve done. This will be the last trip I will be on with just me and my mother in high school. I am extremely grateful for all the work and hours taken out just to be here with me and the kids around her who share this same gratitude. As I leave my last band trip, my last bus ride, my last concert, my last high school band experience, and my last high school trip with my mother. I say thank you to the Buchanan High School band program for all it has given me. When I first heard about the spring tour I wasn't sure if I was going to be able to go. Then when I found out I got into wind symphony it seemed like it could come quick enough. Yes it was cold and I was the most tired I have ever been, but I wouldn't change it for the world. I can say without a doubt that this has been one of if not the best experiences of my life. I'm so glad that I got to spend time with my friends and even make new ones. For the past 30 minutes, I have been reading some of the blog entries submitted by other band members hoping to gain some wise and inspirational topic sentence to begin my reflection of this incredible trip. As some of you may know, I’ve never been the most eloquent nor well-versed writer, so here goes. As my senior year comes to an end, a wave of nostalgia has been overwhelming me. The idea of leaving everyone and everything that I love and care for terrifies me. Throughout this year, I have frantically tried to create as many new memories as I can, and this incredible trip has helped to do just that. Although this blog was meant to highlight one single favorite memory of the trip, I am having trouble picking just one. This tour allowed me to spend some absolutely incredible time with my friends. From elbow planches with Eric at Stonehenge to overlooking the Seattle Skyline, I was able to participate in so many experiences with a group of absolutely amazing people. 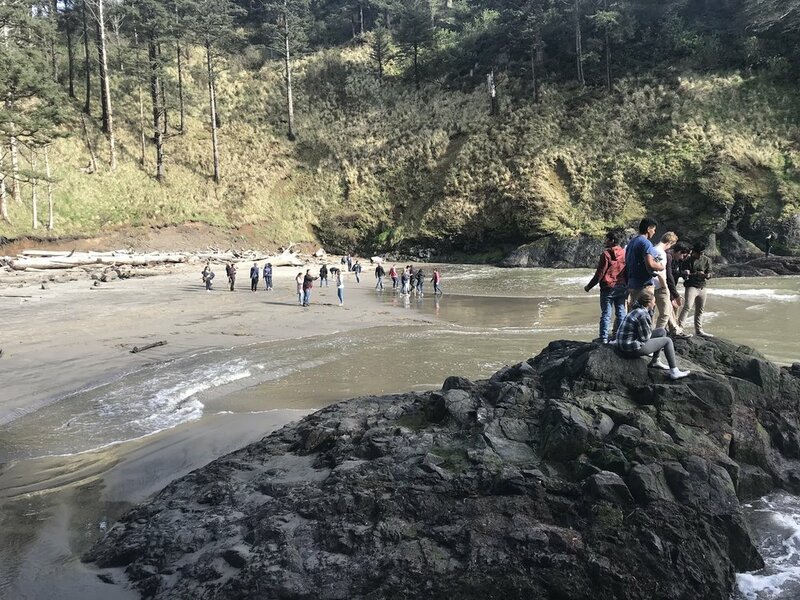 From exploring the wilderness in Cape Disappointment and playing Laser Tag with Mr. Morgan (who’s completely raw at the game btw) in Long Beach, I gained a much higher appreciation for the music program. Through indulging in the delicacies of Pike Place and taking aesthetic photos with the boys, this Spring Tour allowed me to view this group of amazingly talented musicians as not only my friends but as my family as well. I extend my deepest thank you to Mr. Lack and the chaperones who made this trip possible. Without these amazing people, this trip would have never impacted as many lives as it did. I hope that future generations of this program can also partake in this amazing experience. The most interesting part of my trip is easily when I went on almost 85% of the ferry ride in a short sleeve. While I may regret this decision I do believe that I was able to accomplish the goal I had in mind. I have been struggling with accomplishing my goals as of late so I wanted to make sure I was able to. I had a great time with everything so I didn’t have many options. I believe that this was a bad thing over all but definitely the most interesting for me. I hope that this doesn’t cause too much pain in the next week but even with that this is hands down the most interesting. 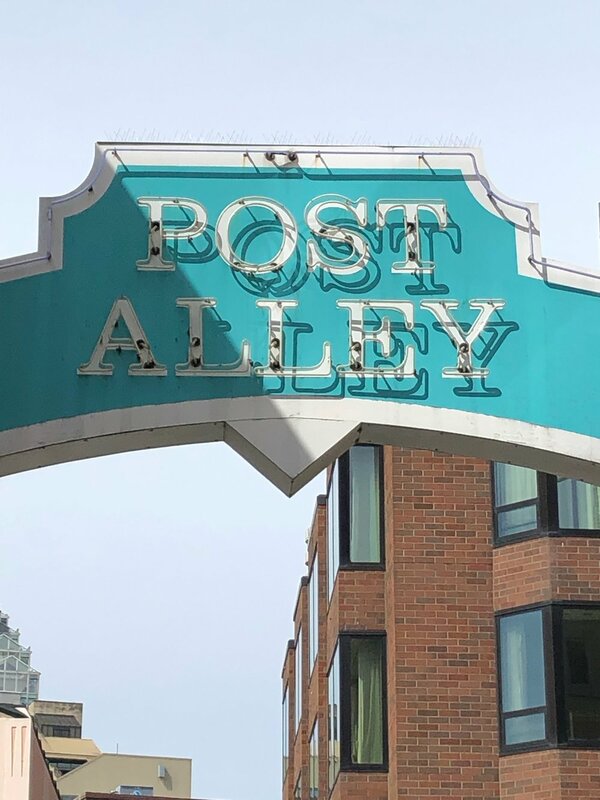 When I found out that we would be going to Pike's Place I was excited to visit all the shops that I had visited the last time I was there. But when we actually got there I found something interesting. The thing I was most excited to do wasn't visiting the shops again, but rather showing my friends around. I got to show them the places I loved so much the first time I visited and watch the excitement and joy in their eyes. It was very different from what I thought my second visit to the market would be like. And I wouldn't trade it for anything.